We all know that the best treats for our dogs are natural, fresh and additive free, but’s it not always easy to find healthy treats that are still tasty. Homemade treats, with tasty fresh ingredients are the perfect snack for your dog – but how many of us have the time or inclination to bake dog treats ourselves? 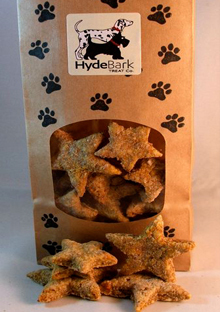 The Hyde Bark Treat Co have done all the hard work for you, and are the ideal place to buy fresh, homemade dog treats from. Henry, Bandit and Skipper were lucky enough to try a selection of treats from The Hyde Bark Treat Co - let’s see if they liked them. I was really impressed with how the treats were packed and presented. The dogs received four packs of treats, which were wrapped in paw print tissue paper. The treat packets themselves were tin-tie Kraft bags, which were re-sealable, recyclable and made from renewable resources. The first treat which the dogs tried were ‘Gnashers Healthy Bites’, which are different shaped crunchy bites coated in sunflower seeds to help with cleaning the ‘gnashers’. These were really popular with all three dogs; they seemed to love their crunchy texture. The ingredients are listed on the pack, and they are all natural ingredients and are similar to what you’d use if you made biscuits for yourself. I’d much rather feed these to my dogs to help keep their teeth clean, that the additive filled alternatives that you find in most supermarkets and pet shops. ‘Gnashers Healthy Bites’ have other health benefits too. The sunflower seeds contain Omega 6 which is known for producing a beautiful skin and coat, as well as a visible sheen. The Bites also contain dill, which can work as an antibacterial and can help inhibit bacterial growth and reproduction in the mouth. It can even help with the early onset if gingivitis. The bites are suitable for freezing. ‘Gnashers Healthy Bites’ cost £3.50 for 150g or £5.75 for 300g. Next we come to Bandit’s all time favourite treats – Harvey’s Honey Bones and Biscuits (£3.25 for 150g or £5.50 for 300g). I think Bandit must have a sweet tooth because he went absolutely crazy over these! There was a mixture of large and small bones in the bag, which I must say looked pretty tasty – I was tempted to try one myself! The bones are nice and big in size and took a while for the dogs to eat, so they felt like a special treat for them. As well as tasting great honey is really good for dogs too. It is a good source of vitamins and minerals and can help with your dog’s skin, coat and arthritis. Harvey’s Honey Bones are also available with frosting for an extra special treat (they look so pretty!). 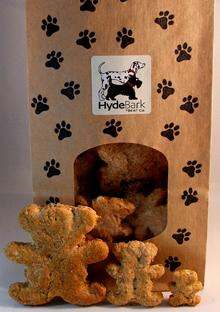 Hyde Bark Tedster’s Peanut Butter Bears have to be the cutest dog treats I’ve ever seen! With three different sizes in the bag these will suit all dogs and occasions – the little ones for a quick reward, and the larger ones for a special treat. It’s no surprise really that our nuttiest dog, Skipper, liked the nutty Peanut Butter Bears – he really enjoyed these, as did Henry and Bandit. They are made with organic peanut butter with no added sugar which contains vitamins H and E. These vitamins help protect your dog from disease, and improve the quality of coats, skin and nails. I never knew that peanut better was so good for you – and dogs! The final treat that the dogs enjoyed was Coco’s Cheesy Stars. Regular readers will probably already know that Henry is a big fan of cheese, so I knew before he tried them that these would be a big hit with him – and I was right! They were an ideal size to use as training treats, or as small reward and are really healthy so perfect for slightly podgy dogs like Henry! The stars are made with parmesan fresh carrots so if the old myth is to be believed Henry will be able to see in the dark! The star treats cost £3.75 for 150g or £6.50 for 300g. Overall I was really impressed with these treats – the dogs gave them a big paws up too! They are just the kind of treats I’d like to be able to make myself, but with all the hard work taken out. 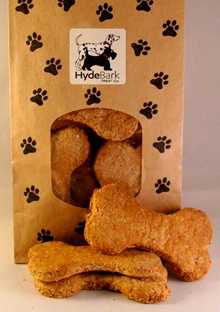 There are many other different types of treats for your dog to try and the Hyde Bark Treat Co also makes a selection of special cakes and muffins – perfect for celebrating your dog’s birthday! 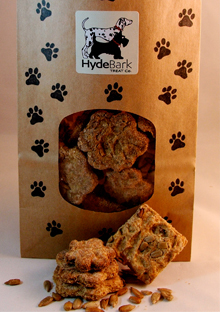 Visit www.hydebarktreatco.com for more information and to purchase some treats for your dogs – they will love you for it!